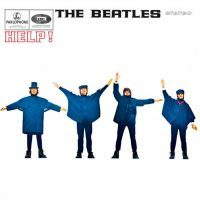 George Harrison's second composition for the Help! album was recorded for inclusion in the film of the same name, although it was later relegated to the second, non-soundtrack, half. Presumably written about his relationship with Pattie Boyd, You Like Me Too Much was Harrison's third song to be recorded by The Beatles, after Don't Bother Me and I Need You. The Beatles recorded You Like Me Too Much during a four-hour session in the evening of 17 February 1965. It took them eight attempts to get right; the backing track had George Harrison on acoustic guitar, John Lennon on tambourine, Paul McCartney on bass guitar, Ringo Starr on drums, and George Martin on Steinway piano during the intro. Harrison double-tracked his vocals, with McCartney joining in at certain times, and John Lennon overdubbed a Hohner Pianet electric piano – an instrument he had also played on The Night Before, recorded earlier that day. Other overdubs included Harrison's guitar solo, and McCartney on piano during the solo and coda. George did all the backing vocals? It sounds like either Paul or John are singing with him. It sounds like George double-tracked his vocals. @Mr. Big- It’s George and Paul. @Joe – It’s Paul on harmony. He’s singing a lower harmony to George’s lead. Harrison definitely harmonized with himself, but it sounds to me like McCartney may have doubled his higher harmony as well. That’s the impression I have when I listen to the vocals on this song. I disagree with Eli about McCartney singing the lower harmony. That’s definitely Harrison. And I think McCartney only doubled Harrison’s higher harmony. I always thout it was John and Paul, but I listened again. George. Actually, the introduction bears a starker resemblance to that of Lloyd Price’s Lawdy Miss Clawdy. This has always been one of my favorite Beatle songs. I think George was very underrated for his harmony vocals & he shows how good he is here by adding superb harmony to his own song. Maybe I’ve read too many stories of George’s later (and many) infidelities but basically what he’s saying here (to Pattie we can assume) is that no matter how badly he behaves she’ll always love him and take him back when she should in fact leave him which is all that he deserves. He says it right out. Give him points for honesty I suppose. This is one of the song which made my day. I used to sing this to my so-called mutual crush when I’m all alone in the house or when he isn’t around. Overall, I always thought that John and George made the backing vocals until a trivia like this came out. Paul is doing the harmony. Its amazing how many times he is left out of a vocal credit. The album sleeve notes got it right this time. Very good chords on the electric piano. John used Maj 7th’s and Major 9th’s. Advanced at those times. To hear McCartney’s backing harmony, listen to the song from 1:45 – 1:50. You’ll hear Harrison stop singing before McCartney does. This song makes me happy. Especially that bass thing Paul does under “…and it’s nice when you believe me…” which flips me out. Although I must admit, it’s not really much of a “Harrisong”… you know, that kind of song that has “George Harrison” written all over it, in bold permanent marker… usually featuring queer melodies and brilliant guitar work, all drenched in sublime harmonies. I think “Think For Yourself” was his first of that breed. Of course, at that point he hadn’t discovered Indian music quite yet, so most of that stuff I just named was part of the Indian influence. Still, this song makes me happy! The rhythm of this song is borrowed from Martha & The Vandellas “Love is like a Heatwave”. It is known as a Charleston rhythm. Listen to both songs to find out. The Beatles in the earlier years borrowed motifs from Motown and other African-American acts. For me, one of the absolute ‘stinkers’ of their whole recorded legacy. Clumsy played bass and drums at a too fast pace, while the melody itself is really non-excisting. It literally sounds as one of those Lennon / McCartney-like songs, many bands tried to copy. Agree. Real fans know that it wasn’t all “genius” every time. This is a real load of dreck. Four of Fish and Finger Pie – or maybe “real fans” simply know you are wrong. I do. Borrowed or not, the chords sequence, the vocal harmonies and Ringo’s fills are really effective on the final result. Piano arrangements make this song easy to identify. The solo made by both guitar and piano is an interesting one. George’s space into the repertoire was increasing little by little. Listening to stereo mix of the song it’s evident that drums, bass, acoustic guitar, tambourine all share one track, the basic backing track done live. So it can’t be Ringo on drums and tambourine. No doubt Ringo played drums and Paul played bass. So the question is who is on the acoustic guitar and who is on the tambourine? My guess is that George played the acoustic as it was his song and he knew the chords and John was on tambourine. That’s what the “In the Studio” portion above says, but the instrument listing at the beginning doesn’t reflect that. The listing needs to be updated, apparently. According to George Martin, George played the acoustic guitar part while John played the tambourine on the backing track, so George played all guitars on this song.